Crocodile Farm Palawan is now a Wildlife Rescue and Conservation Center located 9 kilometers south of Puerto Princesa City. Formerly established as Crocodile Farm Institute in 1987 with the help of JICA-Japan International Cooperative Agency. The goal was to conserve two endangered crocodile species: Crocodilus porosus (fresh water crocs) and Crocodilus mindorensis (salt water crocs). 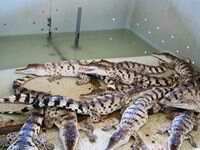 The institute also aimed to introduce crocodile farming technology as another form of income generating project to the farmers in the Philippines. Something like backyard swine production. Instead of a pigpen, a.ka. pigsty, you are going to maintain a crocodile pen in your backyard. Huh!? The institute’s Information Officer at that time, a friend, had a hard time convincing me of the technology. Don’t get me wrong, I did believe him that it’s possible and based on computation it really is economically feasible. But I think it’s the crocodile scare that made it difficult for the institute to reach its goal of transferring the technology. Specially after a typhoon flooded the farm allowing some crocodiles escaped into the river. Not only it reduced the crocodile population in the institute, but it kinda scared the people nearby. And, stories, pinoy style (Filipino style), spread. Life goes on for the crocodiles. The farm, instead of deferring its operations, started to care for other endangered species confiscated from wildlife traffickers, and household pets. The talking Mynas were one of them. The Mynas are very popular household pets before the Anti Wildlife Trafficking Law was strictly enforced. Maynahs can easily mimic a lot of different sounds, from whistles to engine roars, and from beautiful to ugly words. Very entertaining. Get this, while walking along houses with caged Mynas hanging on their windows, one whistles at you and in the next house another Myna calls you pangit (ugly). Delightful! So they were rescued from becoming the bad girls and boys in the neighborhood. Hello, says the green parrot! Hi, replied the other one! They like to confuse you. 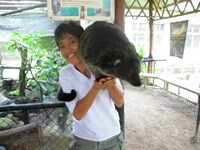 So crocodile farm Palawan developed and established a nook for rescued animals. And to earn more funds to feed additional beaks, mouths and snouts they opened the center to tourists for fees. It then fancied a new name, Crocodile Farm and Nature Park. Just as the crocodiles are enjoying the company of other wildlife friends, not so nice tourists walking along the bridge overlooking huge crocodiles in pens, started throwing coins hard on the poor animals. They spit on the crocodiles and drool while laughing at the expense of the confused reptiles. I personally witnessed the disgusting display of cruelty towards the mostly docile creatures. I hope the staff at the rescue center will follow on my recommendation to station some personnel at the bridge to avoid another untoward incident like that. And also to fish out those coins that were dropped or thrown in the pens so it will not invite such repulsive behaviors from the tourists. I’d rather they do their raucous thing at the House of the Majority and the Minority. There is where the sleaziest consumption of barrels of pork containing people’s taxes. We all know that crocodiles are being projected like a corrupt politician (or is it the other way around?). Anyway, at least crocodiles eat only when their hungry and get satisfied. But the crooked ones in the legislative bodies won’t stop and could not just be still like the real crocs when they’re full. Crocodile farm Palawan isn’t one of those legislative bodies. I think those tourist didn’t quite get what place they’re in. 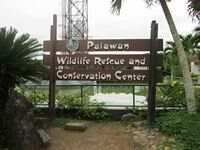 It’s the Palawan Wildlife Rescue and Conservation Center, clearly displayed at the entrance of the center. Yes, the park changed its name once again, realizing its role to the endangered species in the province. The animals were RESCUED from the already stressful traffickers and so they must be treated with love, care and awe. Come visit Crocodile Farm Palawan, or Palawan Wildlife Rescue and Conservation Center and enjoy the wildlife and learn to appreciate their significance to our lives. See it, sense it, save it!